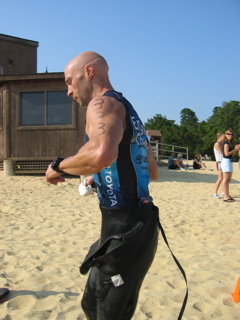 This was good for me to get back into the water, I am allowed to kick but not swim. I coach the Swim For Fitness at Princeton Fitness and Wellness Center, formally know as JAM, so I jumped in before practice to get warmed up, knowing that I was going to do a set with the team. That was it for Saturday, and I felt good but tired after. Sunday is a long run so this should be fun. Friday October 26, 2007 - Running in the rain! Fall is upon us and so is the cold, wet weather. So my goal is to run outside, not on a treadmill all winter. Good run, cold at first but once I got wet it felt great and I was happy to be outside not running on a treadmill, so the first run went great. So here we are, starting this blog! First thing that every triathlete must do is join USA Traithlon, not only does this help when going to races and getting discounts at races, but also help as a donation to the USA Traithlon group. Another thing is make sure while training that you are careful, if you are training outside. My season was ended in early September because a motorist was trying to beat traffic and turned into me, running me over and totaling my brand new bike. Now you would think that all this would be simple, but Geico her car insurance is dragging their feet while my insurance company Aenta has been over the top helpful and accommodating to me injuries and personal therapy. To say that that little Gecko should feel what I felt as I was being drag is a understatement, it is a shame that even though the women who was driving the car, who feels awful and has plead guilty, Gieco has not done anything to make this right. So things that you should always carry on you while biking or running, a iPhone and Road ID. With that put behind us, here is what I did yesterday. So what does all this mean, well yesterday I was just trying to stay in a low gear (gearing is big chainring/small chainring, there is a whole equation to break it down but I will stay away and make it simple), and spin at a 60+ cadence. My gearing was at most times set to 53/14, not bad but I was tired. The hardest thing to do is critique yourself, give away your training and let down your guard. In 2008 this will be my 4th season doing triathlons and every year with great improvements, mostly die to reading and learning from others. So AlwaysTri-ing.com is set to help out beginner to intermediate Triathletes. Most of what I write on this blog will be my stats, people that I train, Master swimming programs, and general feeling towards my training.